Piano Fun: Is My Piano Worth Repairing? Is My Piano Worth Repairing? Here's a letter I recently received from one of my subscribers who had a question about getting her piano tuned and repaired. I have one of those uprights (wurlitzer) that hasn't been tuned in about 7 years. After reading your article, should I even bother with calling a piano tuner? I'm trying to make a decision whether to buy a new piano. I don't want to just throw my money away on getting this one tuned if tuning turns out to be futile. So I do need some advice. I love to play and want a nicer sound. 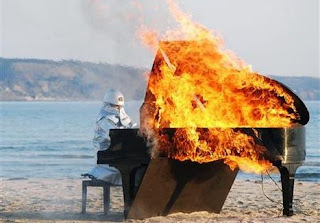 What is frustrating is I've talked to those in the piano business, and they will charge me to send a tuner out whether or not the piano is even worth tuning. The over all answer to your question is "it all depends." How old is the Wurlitzer? Is it a true upright, or a studio, or a console, or a spinet? These are all designations of a vertical piano. It was tuned seven years ago. How regularly was it tuned before that? (That's the big question). How much sentimental attachment do you have for it? How much could you get if you sold it now, and how much of the cost of a replacement piano would that cover? Most of these questions could be answered by a piano technician. I would guess that most piano technicians are honest and would be willing to talk to you on the phone and answer some of your questions. A tuning runs about 100 bucks these days, which includes some regulation. Major regulation might cost another hundred. As for major repairs, the sky is the limit. Major problems could include a warped or cracked sounding board, a weak pin block, restringing, cracked harp, refelting, and numerous possible problems with the action. I recommend calling a tuner and ask what he would charge to come over and give you a consultation. Ask if that would apply to any tuning or repairs if you plan on going in that direction. Give him the serial number over the phone. He should be able to look it up in the Piano Atlas and tell you lots about the instrument right over the phone. Call at least two and maybe three technicians before you make an appointment. Make certain the tech is a member of the Piano Technician's Guild (or just "The Guild" as I don't know the exact wording of the name). Get a recommendation from a music store as they would tend to feel they have to stand behind anyone they would recommend. Also do some homework yourself. Find a copy of The Piano Book by Larry Fine (not the same Larry Fine who was one of the Three Stooges, in case you were wondering). There's a lot of good advice in there about buying pianos, both new and used. Be aware that some instruments, due to a combination of quality, age, and neglect, simply cannot be tuned. Others SHOULD not be. But many will last several life times if taken care of properly. It's worth a shot. Hi, I'm Robert Laughlin, and this is my blog. After learning the piano in my early twenties, I played professionally in my late twenties. Then traded the bar rooms for class rooms. Want to learn to play piano? Give me three and a half hours with you, and you're there.